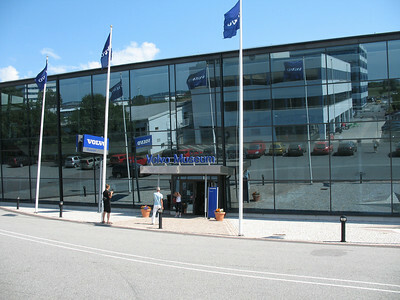 Joe My Tuesday morning destination was the Volvo Museum in Arendal, at the extreme western edge of Göteborg's working harbor, which lines the northern bank of the Göta. According to our guidebook, "you really need a car to get there," which was not strictly true—a tram to the middle of a residential neighborhood north of the river, followed (after a brief but lovely sit in an air conditioned waiting room) by a half-hour bus ride into the harbor itself, left me just 100 m from the entrance. The museum sits on the wharf, with a view of the harbor and, that morning at least, a cool breeze off the water. As for the museum itself, well, this is not the Ford Museum. 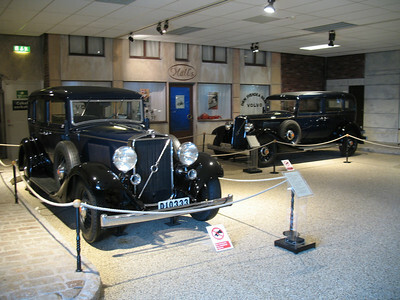 The Volvo Museum is a decent size, but easy to cover in some detail in a few hours. It does have the one thing the Ford Museum lacks, though: amidst Ford's sprawling jumble of Americana, there is no coherent history of the company itself. The Volvo museum starts from the beginning, moving from the desk of the founders to the very first model produced, and then going on to a nice collection of cars organised by decade, mostly displayed in little scenes reminiscent of the times (a street scene from the 30s, a gas station from the 50s, a soulless display room from the 80s… you get the picture). There was also a nice collection of concept cars, and some coverage of Volvo's tractor and truck divisions. I was, by the way, the only non-staff person in the museum who was not speaking German. Sweden is a popular tourist destination for Germans, and Göteborg (being just a 30 minute ferry ride from the continent) has Germans aplenty in the summer, but even so this seemed like a high concentration. A few of them seemed to be Volvo groupies, all decked out in Volvo t-shirts and hoodies. It takes all sorts, I suppose.